Our Dancing With The Teachers journey began in the fall of 2010 on a beautiful, brisk October day. Former Fieldstone teacher, Amy Leibel, had an idea that she shared with her group of fourteen advisory students. She wanted to provide students (ages 12-15) with an opportunity to experience the incredible feeling of pride that comes with working hard to achieve a goal. Together, they decided they would set a goal to raise $1000 for Stand Up To Cancer (SU2C), an organization dedicated to fund research to find a cure. This was a cause to which they all felt a strong connection. Amy Leibel shared her vision with current Fieldstone teacher Jennifer Harrington, and their advisory groups began to work together to raise funds. It was then that Dancing With The Teachers was truly born. These two teachers formed a lasting partnership and friendship, and continue to dedicate themselves to the cause to ensure that Dancing With The Teachers will always be a success. In October of 2010, an e-mail was sent out to the Fieldstone Middle School faculty to see who would be interested in taking private ballroom dancing lessons, rehearsing, and ultimately performing their routine in front of an audience for the final show. Without knowing exactly what to expect, nine very brave faculty members volunteered to be the first ever DWTT “contestants”. Over the next few months, something wonderful began to happen in the hallways and classrooms at Fieldstone, as the school became united in an unstoppable movement to raise money for SU2C. The night of the first event finally arrived on February 11th, 2011. When the show began, and the lights dimmed in the packed auditorium, there was a true sense of magic and emotion in the air. For all of the teachers and students involved, this was the moment when the feeling of success for what we had accomplished really sunk in. In that first year, Fieldstone donated close to $14,000 to Stand Up To Cancer. In 2012, the Dancing With The Teachers journey blossomed into something even more powerful than was originally conceived. Ten new teachers volunteered to become contestants for Season 2, and they all delivered amazing performances. Jennifer Harrington and the students in her advisory group, F.L.A.S.H. (Fieldstone Lends All Students Hands), led the movement in the school. The students were enthralled at the thought of raising money for SU2C. These students truly began to embody all the qualities of an ambassador for SU2C. Most gave up their lunch periods and free time to sell arrows to create the wall of support displayed in the main lobby, sell tickets, and involve themselves in all aspects of the planning process. The 2nd annual show was even more successful than the first, as the 2012 event raised and donated $20,000. 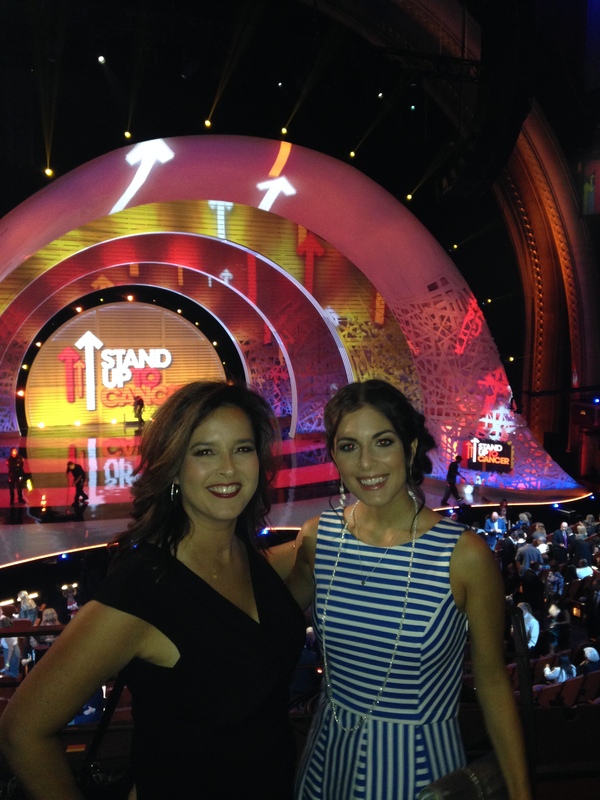 Amy and Jennifer were honored to receive an invitation to attend the Stand Up To Cancer National Telecast in Los Angeles California in September 2012 for their efforts. Upon arrival, they were humbled to be in the company of the top doctors and scientists in the field, cancer patients and their families, and many survivors. They even met a few celebrities! Although there were only two tickets, Amy and Jennifer told everyone they came in contact with about the amazing community of students and teachers at Fieldstone. It was a once in a life-time experience that they both will treasure forever. Suddenly, we were no longer just a small community event; DWTT garnered national media attention last year when SU2C co-founders Katie Couric and Sherry Lansing highlighted the event in two separate Huffington Post articles as an outstanding example of how grassroots movements can make a huge impact in the fight. The support from the community for DWTT had never been stronger, and the 2013 show sold out in less than two days. SU2C also sent a professional camera crew from Los Angeles to document the 2013 show and interview the DWTT cast and crew. Not even a snowstorm, which cancelled school on the day of the show, could derail the momentum. The Bricktown Inn graciously opened its doors to the camera crew, and all of the interviews went on as scheduled. Realizing how important our event was to the entire NR community, our Superintendent of Schools, made an unprecedented decision to open school that evening just for the show. As the saying goes, “the show must go on!”. Last year’s show was comprised of many unforgettable moments. Pearce Quesenberry, childhood cancer survivor and SU2C ambassador, spoke candidly about her personal battle and the research trial treatment that saved her life. Kathleen Lobb, SU2C co-founder, proudly shared that DWTT was one of the top ten grassroots fundraisers in the country. Packed with spectacular performances and moving messages of hope and love, it was a very powerful show. In May, Amy and Jennifer had the honor of presenting Katie Couric with a donation check for $23,000 on the set of her television show. That next month, the DWTT team travelled to NYC to attend a press event for the groundbreaking Ken Burns documentary based on the book Cancer: The Emperor of All Maladies which will premiere on PBS this Spring. The DWTT team started off the 2013-2014 school year more energized than ever. We held a school wide Pink Out for Breast Cancer Awareness Month, planned a holiday boutique, and sold Italian Ices during the lunch periods. In October, in collaboration with NY DanceSport, we organized a Flashmob of over 100 people at the Palisades Mall in West Nyack, NY. The huge crowd of unsuspecting shoppers was so impressed by the surprise dance performance that they threw donations down from all four floors. One of the projects the team is most proud of this year, is the creation of a “Quilt For A Cure”. Community members designed each individual quilt square with messages of hope, strength, and support for loved ones affected by this disease. The beautiful quilt, will be displayed permanently here at Fieldstone. So here we are. This journey has brought us together again in 2014, for the Fourth Annual Dancing with the Teachers event. This year, ten new faculty members will compete for the Mirror Ball Trophy as they dance for a cure in the first ever two-night event. NY DanceSport has trained a total of thirty-nine teachers and faculty members, many of whom had no dance experience whatsoever, to take a giant leap of faith and dance. This event has become a four-year journey during which the lives of many of the people involved have been touched and changed forever. An entire generation of students, grades 7-12, have exhibited a sense of compassion and empathy for others and should feel empowered to know that they really have made a positive difference in the world. Retired teachers have volunteered tirelessly to organize and run our school fundraisers. The faculty members who have been involved have formed genuine connections, friendships, and relationships that transcend the professional environment of a school. So many people have worked hard to make tonight’s show a shining example of how teamwork, dedication, strength, and caring for others can change lives in powerful ways. We dedicate this event in memory of Lorraine Brenner and Jackie O’Grady, two amazing women who lost their battles with cancer this past year.